MASTER PROBLEMS Emotions and Personality How to overcome fear of flying? Are you afraid of flying? With some it is more than fear—it is a phobia, a disproportionate fear that can lead to panic reactions. What can help? Becoming an informed passenger can do much to quell some anxiety. If you are nervous about air travel, read books on flying, planes, and pilot training. Read about the high standards of training that are demanded of pilots and the rules they work under with regard to hours of sleep, limits on consumption of alcohol before flying, and random drug testing. Also there are the semi annual checkups that pilots must pass in a flight simulator to test their reactions to emergency situations. These simulations are so lifelike that some pilots exit the simulator “shaking and soaked in perspiration.” If a pilot fails the simulator test, he can lose his license to fly commercial aircraft. These standards are far higher than any imposed on those who drive vehicles. Therefore, the more you learn about planes and pilots, the more your confidence can grow. Remember every year worldwide many aircrafts( about 10 million flights in the USA alone per year) are serving over 40,000 airports to transport over a billion people with relatively few accidents or incidents. In fact, it estimated that it is 25 times safer to traveling by air than by car. However, your perceptions and fear of fatality may be as a result of the media, when they greatly publicize every airline crash and tragedies, while the daily carnage on the roads is taken for granted. So if you feel safe when travel by car, then you should be much safer in an airplane. If your anxiety is because you have never flown before in an airplane, it may also help to visit an airport. Note the procedures for passengers, and observe how people are reacting. 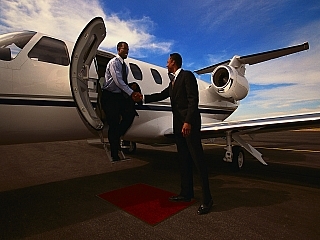 You will notice that most people step off a plane as if they were just stepping off a bus. Air travel for them is commonplace. Watch planes taking off and landing. Understand and admire the scientific principles of aerodynamics that make flight possible and safe. When you finally take your first flight, tell the flight attendant that it is your first time in a plane and that you may be a little nervous. These professionals know how to help you to relax and have confidence in the system. Try to relax. When the captain says it is OK to walk about the plane, get up and take a stroll about the cabin. You may be well on the way to conquering your fear of flying! In one year about 1.3 million people die on the roads of the world. In contrast, the number of deaths from airline accidents in 2011 was 373 worldwide. According to statistics the crash were from airlines know to have safety problems. Why is a plane normally safer than a car? One obvious reason is that unlike vehicles on the road, planes do not usually fly in close proximity. Another reason is that most airline crews are highly trained and professional in their approach to their responsibilities. A captain of a Boeing 747 will usually be in his 50’s and have about 30 years of flying experience. Safety is the primary factor for all members of the crew. After all, their lives are also on the line. If you stop to look inside the flight deck of a passenger plane, you will notice that all the primary instruments and controls are duplicated—one set on the left for the captain and the other on the right for the copilot. Another safety factor on the flight deck is that as a precaution, the captain and the copilot usually have different meals. Why is that? So that in the unlikely event of food poisoning, only one of them would be affected. A doubling or even a tripling of systems is a standard safety requirement for most modern planes. What can you do to feel safe? (1) Read the instruction card for emergency situations, and listen to the flight attendants when they explain safety procedures at the beginning of each flight. (2) When you take your seat, check to see where the nearest exit door is. And in case of an emergency, follow the flight attendants’ instructions. They are all highly trained to handle difficult situations, should any arise. (3) When instructions are given, it is vital that passengers move quickly and forget about their belongings. Life is more important than possessions. Modern planes normally fly above or around the weather, so most long-distance flights are very smooth. As a consequence, very few people experience airsickness. If any turbulence is expected, the captain usually advises the passengers to be sure to buckle their safety belts as a precautionary measure. Could travel by plane be safer? The answer is yes. But most passengers would not tolerate the necessary change. What would that be? Have passengers face backward rather than forward! What advantage would there be in that? Passengers would be supported by the backrest during sudden deceleration instead of by just a seat belt fastened across the abdomen, which is incomplete protection compared with most car seat belts that additionally cross the chest. However, people prefer to see where they are going rather than where they have been!